So many factors attract top talent. So many factors keep good talent. One of those factors is the image of your company. If a company is seen in a positive light, people will want to work there. They will want to tell people that’s where they work. A business book creates a positive image for your company in a number of ways. People who read it will be impressed. They will read about your accomplishments. They will read about your values. They will read about your people. The media will be impressed. They’ll pull quotes from the book. Or they’ll mention the book in an article. All this comes full circle to impressing people who have not read the book. And it will encourage some other people to get a copy. If there are specific people you wish to attract for a top position, guess what to use as an ice-breaker? Make sure everybody in your industry association has a copy. People in your industry are likely to network through the association. Make your book available whenever someone from your company speaks. The audience will likely include potential hires. Make sure local media have a copy. Highlight for them the parts that you think might be best for their future stories. Make your book about the company’s people. Nothing will impress a potential recruit than a flagrant example of valuing your employees. Get your employees to help market the book. Include their comments on your website. Give them an image to share on social media. 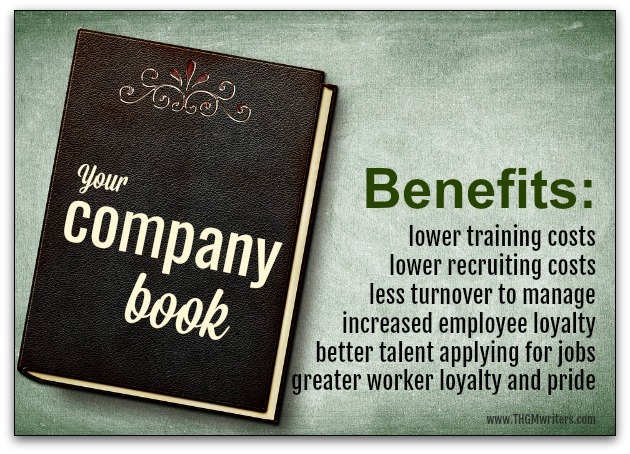 Make sure that your recruiting agency has copies of the book. Have the book available at trade fair booths. Many people at trade fairs are also potential recruits. No matter how you look at it, a book can build your company’s reputation. But it is worth looking at if from the perspective of one important audience: the people you want to recruit to strengthen your team. Is there a book that can make your team stronger? You bet there is!